Pac-Man Battle Royale is one of the latest slot machines to play Pacman. Until recently, available only in Japan – it can now be found in amusement arcades in the U.S., as well as in other parts of the world. Pac-Man Battle Royale is not the cheapest equipment and to play it you also need some money for the seat reservation. 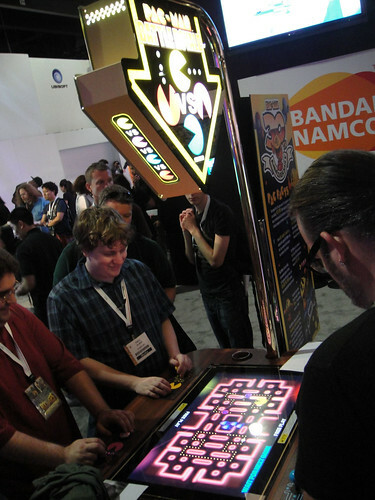 Pac-Man Battle Royale is an unusual machine to play Pacman game, because it has four player seats, which may suggest that this is a multiplayer game. And indeed it is. In the Pac-Man Battle Royale there is not one but four Pacmans. How does it work, then? As in the traditional game you move your own Pacman, eat dots and, of course, there four ghosts chasing you, which can also be eaten if you get a large yellow dot. So, why 4 Pacmans? 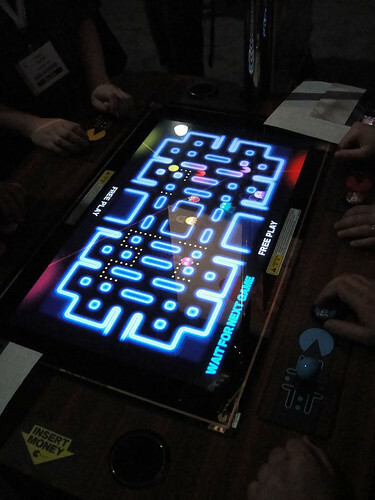 Pac-Man Battle Royale, as the name suggests, is a battle – a battle between Pacmans. In this battle it’s not only the points you gain that count, but your ability to survive. It means that you’re in the game as long as there is only one Pacman on the board left and this one is the winner. It suggests that you can play Pac-man Battle Royale for hours. Where did the Pac-man Battle Royale idea come from? It arose in connection with the 30th Pacman games anniversary which we celebrated last May. At first, Pac-Man Battle Royale appeared only in Japan, where Pacman originated, and at the beginning of this year you could play Pac-Man Battle Royale in different parts of the globe. Curious, what the game designers have in stock for the next round anniversary. This entry was posted on Wednesday, March 16th, 2011 at 8:47 am and is filed under Games. You can follow any responses to this entry through the RSS 2.0 feed. You can leave a response, or trackback from your own site.